Examining the story of Noah, a man who loved his boat. 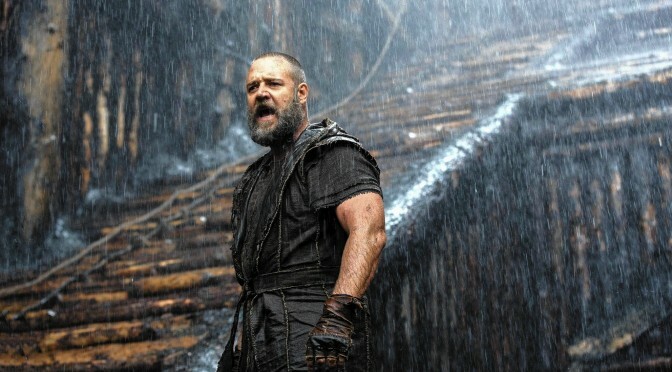 I just finished watching the latest Biblical blockbuster, Noah, starring Russell Crowe. It was fun, or would have been if they'd allowed even the smallest hint of humor to make it to the screen. But even the weightiest script could not succeed in sinking this, perhaps the oldest of our myths. So let's look into this story: Not just the Biblical version, but the older variations (on which the Genesis account is based, more or less). Because there are many. For many of us, it's one of the first stories we remember being told by our mother or father or Sunday school teacher. It couldn't be designed better for children if it had been done so intentionally. There's a fantastic supposition (the Creator of the world capriciously decides to destroy it and start over), a giant boat, a heroic father who manages to save his family despite the end of the world, a parade of animals (the list of which has sent many a toddler in a flannel onesie to sleep), and a happy ending that even manages to work in an explanation for a natural phenomenon familiar to the child, as well as a warning that the child never look at a naked adult. As I said, perfectly designed to be told to a child, remembered by that child all his or her life, and told to his or her own children. Like Goldilocks and the Three Bears. Or Cinderella. Or (in my house) Supergirl. But my point is, the Bible doesn't use the word "rainbow" at all. The word is bow. In the original Hebrew, it's even clearer: The word קֶשֶׁת refers to an archer's bow! Remember that; I'll be coming back to that point shortly. The words in the verse are spoken by the divine character simplified to "God" in English, but represented by several distinct terms in Genesis. The one used in the Noah story is Hashem. This word is feminine plural, essentially translating to "goddesses". Another odd thing is that the word translated into English as "ark" is the Hebrew word tevah. This is the same word translated as "basket" when the baby Moses, inside one, is hidden in the bulrushes. It's the same word used in "Ark of the Covenant" to describe a golden chest light enough for six men to carry. Generally a tevah isn't particularly large—not something you'd want to go traveling in with your cat, much less two of every species on Earth. I mention these things because they relate to a premise toward which I am slouching even as you read. Be patient. It's a mistake to try and take the Noah story at face value. It ends up demeaning the rest of the Bible in the process. Feel free to tick off some of the hoariest arguments here; but consider that the dimensions of the ark make it substantially smaller than one of our modern ocean liners, and not even a supertanker could hold within it two of every single one of Earth's estimated 8.7 million animal species, even if they did line up and board without supervision. Even if the silly unicorns—or the dinosaurs—couldn't stop playing long enough to enter. 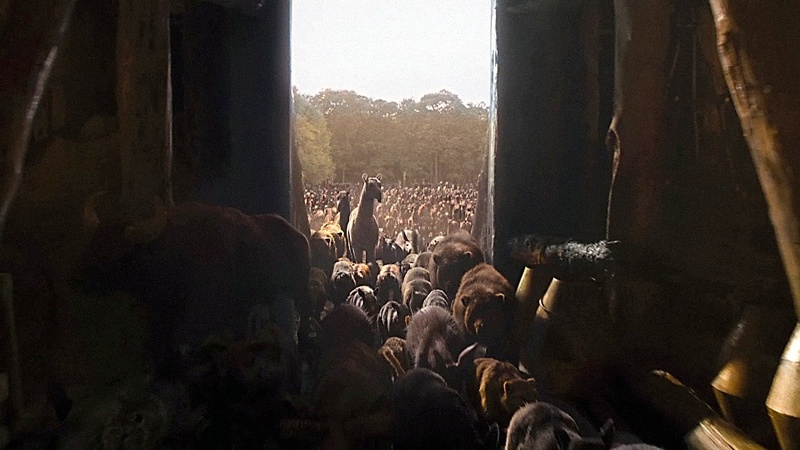 On the other hand, I believe it is a mistake to throw the Noah story out just because it cannot be literally true. Certainly, many Christians accept a metaphorical reality to the tale. But I would propose that it might well be the report of a real event, told in the manner of a children's story, to make sure it persists long enough to send a message from the dimmest reaches of the past into the future…(our present). There is evidence Earth has been completely covered in ice on at least three occasions. But ice is less dense than water, and so can reach a higher altitude. There is no evidence that Earth was ever completely covered by water. Even when every single ice cap melts, there isn't enough to cover Mount Everest. There's barely enough to cover Florida's Mount Dora (at 184 feet above current sea level). However, the basin of the Mediterranean Sea holds the ruins of dozens of drowned cities and towns that have been discovered; there may be hundreds or thousands more yet to be found. There is a theory, still hotly debated, that the Black Sea catastrophically burst through the Bosporus Strait in 5600 BCE. Yet another theory proposes that the meteor that created Burckle Crater in the Indian Ocean perhaps as long ago as 3000 BCE could have thrown up a tsunami that might have inundated the Middle East. In any case…there was a Flood. Not worldwide, but certainly a regional catastrophe of epic proportions. So…if there are Flood myths from cultures all around the world (there are), and stories get more confused with the passage of time (they do), then, perhaps, if we could read the oldest of these tales, we might get a story closer to the truth. How would we know? Well, the story would make more sense, have fewer internal inconsistencies. So let's look at the source of all the tales in Genesis: the writings of the Sumerians, the oldest known civilization, who invented (they said they were "given") writing, and who wrote prodigiously on clay tablets, hundreds of thousands of which have survived and been discovered…and translated. According to some of those tablets, copied by school kids thousands of times (and saved by proud parents), Earth was discovered by aliens called Nibiruans, because they came from the planet Nibiru. (NI.BI.RU in Sumerian means Planet of the Crossing, because Nibiru has an extremely elliptical orbit that comes close to that of Mars once every 3600 years, spending the rest of its time in the dark, far reaches of our Solar System.) The Nibiruans came on a quest for gold, which in addition to its use in their electronics, also was vital for repairing their planet's atmosphere, which had been damaged by over-industrialization. Monatomic gold dust, scattered in the upper atmosphere, would remain suspended for thousands of years, acting as a shield when Nibiru approached the Sun, and providing a greenhouse effect, keeping heat in when Nibiru was at the dark end of its orbit. In the Sumerian's mythology, there were many Nibiruans on Earth—they were the "Nefilim" mentioned in Genesis. The word, both in Hebrew and Sumerian (the Hebrew language derived from Sumerian), means "Those who from the skies fell." However, there were just 12 Nibiruan "gods" who ran things. The chief was Enlil; it was he who, as "Lord of the Gods" (Adonai Elohim, in the Hebrew version of Genesis), walked in the Garden of Eden (in Sumerian, E.DIN means "laboratory in the south," Kenya's Great Rift Valley) with Adam. But it wasn't Enlil who created Adam and Eve. That trick was pulled off by Enlil's half-brother, Enki, and their sister, Ninhursag. Enki's "symbol" was what we now call the caduceus: Two snakes intertwined. That's right, it was Enki who was the "snake" in the Garden! And it was Enki who took the original genome of the native species, Homo Erectus, and added 223 genes from a Nibiruan to create Homo Sapiens…a slave species. I cannot accept all this as coincidence. It isn't reasonable to think that the Sumerians, who couldn't have known anything about genetics themselves, associated the entwined snakes with their genetics god by coincidence. But if the Nibiruans are real—and there's plenty of evidence suggesting they are, or, at least, were—and they understood genetics and the structure of DNA, then the choice of the caduceus for Enki makes perfect sense. Okay, so, there are several different stories in the Sumerian archives about a Great Flood, told about something ancient even to them. (Remember to picture the Sumerian kids in school, copying these stories down, between passing little clay notes to each other and making plans to get together at the Goat Milk Shake joint after school.) We are going to focus on one Ziusudra. He is listed in the Sumerian King Lists as the last Sumerian king prior to the Great Flood. Ziusudra has had many different names as languages were changed and centuries passed. He was called Atrahasis and Utnapishtim by the Akkadians; and, of course, Noah by the Hebrews and Noe by the Greeks. But the stories all have this in common: A man in his 800s who is told by a god that the world will come to an end in a great flood, and who is given the task of preserving land life and humanity from the disaster. Going back to the earliest surviving version—and remember, that is still told thousands of years after the event, itself—we learn that Ziusudra is actually the son of Enki and a human woman. In the Book of Noah (fragments of which were found among the Dead Sea Scrolls), Noah's birth is described as being abnormal and his appearance, pale and spindly, with wispy, pale hair, not only frightened his parents but bears an uncanny resemblance to alien abduction stories about hybrid alien/human children. If the Sumerians were right and Ziusudra was a king (Lamech, Noah's father in the Biblical version, was also a king, as the generation lists of Genesis are actually Sumerian king lists), that doesn't mean he lived in a palace. Beautiful brick temples were built for the Nibiruan "gods" but the humans lived in reed huts. A "king" in those days was merely a go-between for humans wishing to ask a favor of the gods. In today's parlance, Ziusudra, even though he was a half-son of a god, was basically an executive secretary—or a priest. From the Sumerian: "When Ziusudra by the words was awakened, to him Enki said, 'Reed hut, a calamitous storm will sweep, the destruction of Mankind it will be.'" The oldest stories of the Sumerians were said to have been dictated to Ziusudra by Enki himself. Ziusudra wrote what he was told, without understanding much of it. Enki communicated in mental images, as did the other Nibiruans. The presence of half-Nibiruans ("The sons of the Gods saw that the daughters of Men were fair, and took them unto themselves as wives…") may have been necessary to translate from the Nibiruans' thought images to words. And, obviously, without his father's vast understanding of science, Ziusudra may have had to use metaphors to convey the meaning of what he saw in his mind. In any case, according to Ziusudra, and filtered through my vast understanding of science (and my slippery grasp of Sumerian), here is what happened. An asteroid (or comet or meteor) was on a collision course with Earth. It was a big one. It was going to cause an ELE, or Extinction-Level Event. It's unclear where it was going to hit, but I like theBurckle Crater theory best, myself. Enlil, commander of the Nibiruan presence on Earth, had never been happy with the creation of a slave species on Earth. He felt the karmic costs were too great. 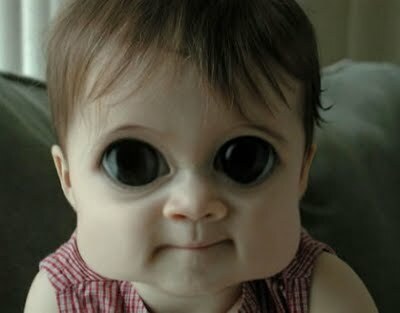 He had been especially unhappy when the prototype humans had been given the ability to procreate. (That's the "eating of the fruit of the Tree of Knowledge" Adonai Elohim was so upset about, that he closed the E.DIN laboratory. In the Middle East, even today, "knowledge" is a euphemism for having sexual relations.) So when, almost magically, this asteroid showed up, he decided it was the time to end the human experiment. So Enlil held a council of the twelve highest-ranking Nibiruans, told them about the coming disaster, and made them vow to not tell the humans. After all, why cause panic when there was nothing to be done? The humans couldn't really survive, anyway; and the Nibiruans, who had done a little procreating of their own while here, would barely be able to fit in the ships that had brought them here…that "to Earth from the skies fell." But Enki, who had put his heart and soul into the genetics experiment, had fallen in love with his creation and couldn't bear to see it end like this, crushed by a mile-high wall of water. But he had been forced to vow not to tell any humans! What to do? Our ancestors, Homo Erectus, like chimpanzees and other mammals, communicated with sign and body language and pheromones, none of which the Nibiruans could understand. So when they designed Homo Sapiens, they included enhanced vocal abilities, to make communication easier. Speaking aloud was not easy for Nibiruans; it was not their natural means of communication. But Enki could make sounds. In fact, he was, in addition to being a geneticist, a linguist who had invented the language Ziusudra spoke. And so, that evening, he wandered near the reed hut of his hybrid son, speaking aloud. "What a shame," he said, "that I have promised not to tell my children that the world is about to be destroyed by flood! Because, if I could, I would give detailed instructions to Ziusudra, my favorite, on how to survive." He went on to rattle off details, which Ziusudra, listening through the reeds and being no idiot, was quick to copy down. They were a little on the vague side; but Enki also assigned a Nibiruan engineer to assist in the project. Even with the engineer's help, Ziusudra needed help building the boat, which was designed to be a submersible. (Even today, the word used in Hebrew-speaking Israel for a submarine, is the word for basket—the word we translate as "ark".) In addition to his own family members, Ziusudra as king had access to workers. The size of the submersible was actually made to accommodate all the people who worked on it. The animal embryos took up very little space, not much more than the birth animals. (The pairs were so the birth animals themselves could reproduce.) No room was assigned to engines, of course. But there were probably battery-operated electric lights, which are known to have existed at this period, though only used by the "gods." The signal (sign from "god") to enter the ship wasn't a long rain—though, historically, Ziusudra lived in a time of climate change, and there had been a severe drought for centuries. (The name of the man in Genesis, Noah, means "respite" because his (adopted) father, Lamech, hoped that Noah's strange appearance was a sign from God there would be "respite," deliverance, from the drought.) 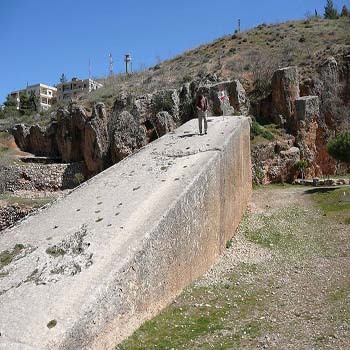 Ziusudra was instructed to watch for a wall of flame over Baalbek in distant Lebanon, the Nibiruans' spaceport. 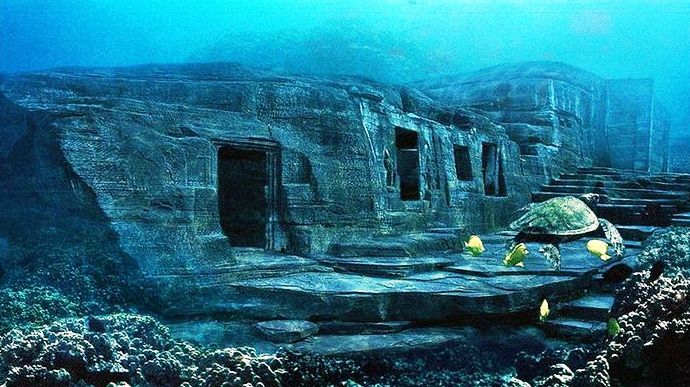 That would mean the Nibiruans were leaving the earth in their ships, and Ziusudra and the other passengers must immediately enter and seal the submersible. 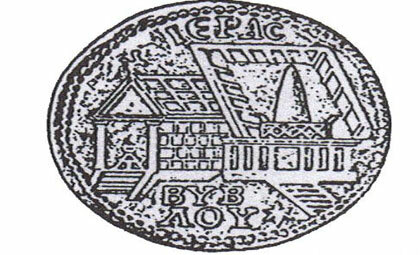 The shape of the "ark" and its positioning had been calculated by Enki with care. The wall of water slammed like a giant mallet over the surface of the Earth, and actually triggered a tsunami that circled the Earth. Water did not cover everything, as Enki had feared. But the middle east was flattened and drenched. 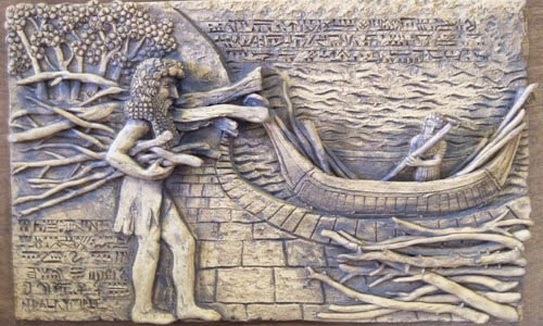 For those in the "ark", there was much fear; Ziusudra had to constantly remind everyone on board that he was the son of Enki, and Enki had promised to keep them safe. The ark was constructed in two shells: A solid, waterproof outer shell, and an inner shell that rotated freely so the passengers were always upright. The initial slam of water must have been terrifying. But once the turbulence died down, the ark was able to bob to the surface, and with the outer shell aligned with the inner shell, Ziusudra was able to open the upper hatch for air. After a period of time, the waters receded. There was no sign of wreckage or carnage. In fact, the flood laid down nine feet of mud, which was discovered by archeologists in the 1800s. It was that mud that was used by the Sumerians to make their clay tablets. The ark came to rest at the Greater Mount Ararat, and the passengers exited to find rather bleak surroundings. But the "sacrificial" animals had another purpose. Ziusudra butchered one to make a celebratory barbecue. When their sensors revealed the top of Ararat, Enlil led the first landing party. The Nibiruans were starving by this time, as, due to the drought, they hadn't been able to bring adequate supplies. But Enlil found something he never expected: Survivors. Human survivors. Ziusudra, of course, offered to share his goat meat with Enlil and the others on his ship. And Enlil, startled to find the humans he expected to be extinguished still alive, and with food, yet—well, he took this as a good omen. Relaxing by the fire with Ziusudra after dinner, he made a promise. "Never again," he told Ziusudra, "will I allow humanity to perish from a global flood. And," he added pointing up to the sky, "there is the mark of my promise: That bow." 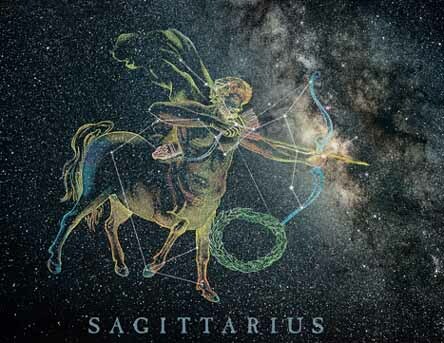 Ziusudra looked up in the direction of Enlil's oddly-shaped fingers, and saw the constellation Sagittarius, the Archer, and the stars that make up the archer's bow. He knew, having been Enki's secretary for so long, that somewhere in that constellation was the current position of Nibiru, thought it couldn't be seen. Enlil was telling Ziusudra that other "gods" from Nibiru itself would scour the solar system for errant asteroids and comets and make sure none would ever strike Earth again. Enki was in another ship, and he landed in South America, which had largely survived the tsunamis and food could be had. That's where he was called Quetzalcoatl, the "white god" who stayed for awhile before leaving on a promise to return. (Nibiruans had almost dead white skin.) That promise is why the Incans, when the conquistadores showed up in the 1500s, just handed them the gold Enki had requested them to mine. Is this, in fact, what happened? Well, I think so. It fits all the observable facts, including many that I've omitted here for brevity. Obviously, there are serious implications here—not least of which is there is evidence for a flood, but not for the Hebrew god Yahweh to have been its cause. But, then, Cinderella's shoes were originally fur. Stories change, and evidence, such as the archaeology and Sumerian writings, is the only way we have of trying to find the original truth of them.